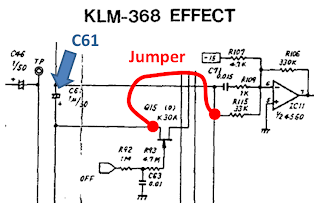 The modification that I performed is located entirely on the KLM-368 PCB ("Effects"). An excerpt of the schematic is shown below. C61 is a 1 uF electroltyic capacitor that the uneffected must audio pass through. If you want to remove this cap, you could simply de-solder it and put a jumper in its place. If you merely want to try the mod without removing any components, you could instead use clip leads to jumper from one leg of C61 to the other leg. Unfortunately, my C61 was soldered too tightly to the PCB, so I chose to jumper between the easily-accessible points on R115 and Q15. A photograph of my modified circuit is below. The green wire is my added jumper. Also in the frame, but unrelated to this modification, is the yellow wire and the empty IC socket. Those changes were performed as part of a different mod to remove the post-effects VCF, which improves the apparent attack of the synth and which alters the high frequency response of the synth. More info on that mod can be found here. Today's mod, though, is just about the addition of the green wire. To assess the impact of today's modification, I recorded the audio at the synth's main output. I recorded it with my trusty M-Audio Microtrack, which I used for all my previous assessments of the frequency response of my Polysix and Mono/Poly. For this test, I set the Polysix for a simple sawtooth waveform, using the lowest octave. I set the VCF to about "5" with no resonance. Below is a visual comparison of the raw waveforms output by the Polysix when playing the lowest "C" on the keyboard. The top plot is the unmodified Polysix, which has its C61 in place. 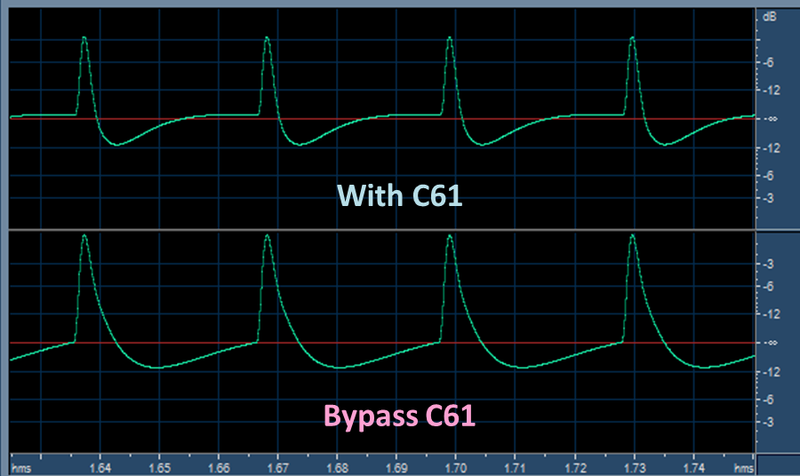 The bottom plot is the modified Polysix, which has C61 bypassed using my green jumper wire. In this plot, you can see that the unmodified Polysix decays back to zero (which is the red horizontal line) more quickly than with the modified Polysix. Remember, the synth is trying to do a pure sawtooth wave, so any "decay back to zero" is an indication of some amount of low frequency attenuation in the synth. The fact that the modified Polysix decays back to zero less quickly means that it has better low frequency performance. If we're discussing frequency response, we really should be looking at the signals in the frequency domain. So, below, I do a frequency analysis of two 5 second audio samples of the output of the synth. The blue trace is the unmodified Polysix, which has the C61 in place. 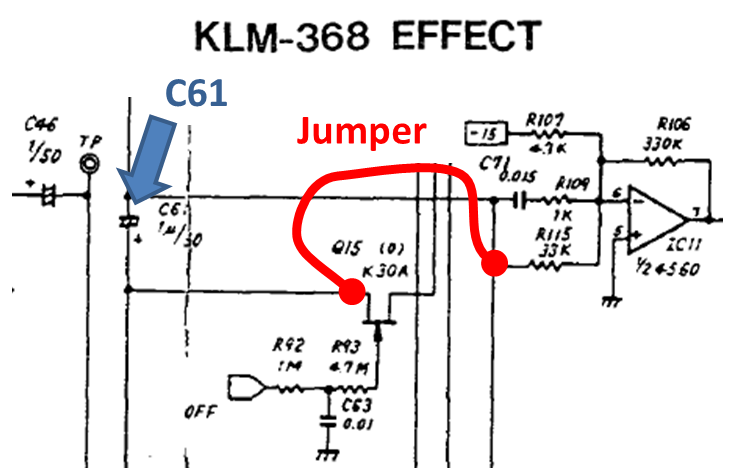 The red trace is the modified Polysix where C61 has been bypassed. Again, this if for the lowest "C" on the keyboard, which has a fundamental frequency of about 32.8 Hz. That is a *very* low frequency. 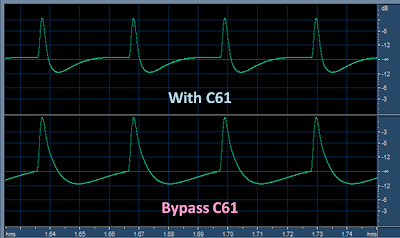 Comparing the two traces, we see that bypassing C61 seems to increase the synth's response at this frequency by about 6 dB. That's a pretty big change! In the real-world, 32.8 Hz is too low for our loudspeakers or headphones to reproduce accurately (especially for hobbyists like me). So I'm not sure that I'm able to hear the impact on these deepest bass frequencies with my equipment. But, you'll see that the next couple of harmonics (66 Hz, 99 Hz) are also slightly stronger after the modification. My system can easily reproduce these frequencies. So, when I'm playing my synth (or when I'm playing the Soundcloud demos at the top of this post), I do hear a difference between the unmodified and modified conditions, I'm just not sure its the change at 32.8 Hz that I'm detecting. That is some seriously deep bass.. Given that I do hear some difference in tone (whether at 66 Hz or at 32.8 Hz), which version do I prefer? Certainly, for raw visceral excitement, I like the added thickness and rumble of the full bass experience resulting from bypassing C61. But, the Polysix isn't intended to be a deep-bass rumble machine -- it isn't supposed to be a Minimoog, or even a Mono/Poly. Instead, it's a polysynth meant for chords and pads and strings and such. So, when used for these purposes, perhaps my modified Polysix now as too much bass. I think that it might sound too thick, too bloated. It's interesting (to me) to note that the Polysix's main competition back in the day -- the Roland Juno 6/60 -- includes a high-pass filter as part of its architecture. One use for the HP filter is to cut the low-end rumble to purposely make the sound more skinny. For chord stabs, a skinnier sound can often sit better in the mix, especially when you've got other instruments providing a deep and punchy bass line (such as for dance music). Perhaps this ability to control the low end bloat to sit better in the mix is why the Juno's continue to be more popular than the Polysix. Back on the topic of the increased deep bass on my Polysix, I'm still deciding whether or not I like the modification. I'm going to have to live with it for a while to see. Thoughts? Update: Better frequency response graph here along with more discussion of how it's done. Update: I decided to properly bypass C61 using a jumper wire instead of my clip leads. See here.